Are you looking for a advanced projector! Come and look at this! 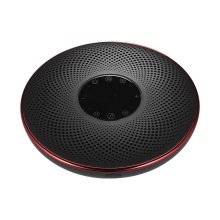 Aibecy UFO-Shape Smart DLP Projector, built-in fast speed CPU and compatible for Android system and , support 2.4G / 5.0G dual-band WiFi & BT 4.0 connection, make you play the games or watch movies smoothly without delay, even online chatting or watching. It is equipped with dependent dual Hi-Fi speaker, and supports full HD 4K/2K/1920*1080 resolution with truly 2000 lumen brightness, 16:9 aspect ratio, 40-300 inch screen display, which will let you enjoy cinema-like experience at home. Delicate and portable, can be used as Hi-Fi speaker to have fun in your party or camping. Take this and you will be shocked by its amazing experience. Compatible for Android 6.0 System: Build-in fast speed CPU + GPU and memory (RAM 1G+ ROM 8G), on the condition of 2.4G / 5.0G dual-band WiFi or BT 4.0 connection, much faster than the ordinary projector, you can enjoy playing the game or watching movies online and will not be distracted by the display delay. 3D Cinema-Quality Display: 30,000 hours lamp with truly 2000 Lumens brightness, support full HD 4K resolution, max. 300 inch diagonal display, present 3D cinema-quality color image and provide brightness enough to used in the daylight, portable design, can be used indoor or outdoors. Multiple Connection&Support Display Mirroring: Interfaces Contain 2*USB+1*HD+1*Earphone Jack+1*DC+1*TF Card Slot to easily connect your U disk, tablet, computer, speaker, earphone, smartphone, meanwhile, smart system support Miracast and Airplay to enjoy pictures or movies from both your phone and your projection screen. One Click Change into Independent Hi-Fi Speaker & Arresting Look: Build-in Dual Hi-Fi Speaker, enjoy crisp audio with nuanced mid-range tones and deep bass, turn on BT function and connect your device, let the projector change into BT audio by one-key; matching with UFO high-technology shape and high-quality appearance, which will make your home party full of more fun. Super Long Time Working & Efficient Cooling System: Equipped with 6 rechargeable batteries (16000mA in total), can really achieve 4 hours video playtime or 16 hours music playback after fully charged. Unique outlet design for dissipating heat quickly and efficiently, safe to use and no worry about heat from long time using. This Item does not include Projection Screen and 2 AAA Batteries used for remote control.